Pedestrians cross the James River on the T. Tyler Potterfield Memorial Bridge in Richmond, Va.. I owe Richmond an apology. Countless times I've zipped past the exits that are not quite far enough for a pit stop after leaving Washington, D.C. Last month, I ran out of excuses. I pulled off Interstate 95 and entered Virginia's capital city for the first time. Only 100 miles south of the District, this former Confederate capital with a quarter-million people felt, at times, decidedly Southern, with grayback statues lining a celebrated avenue and shopkeepers offering customers an unhurried welcome. But other times, I felt like Richmond was plucked out of the Rockies, with its steep hills, dozens of breweries, and outdoorsy residents. 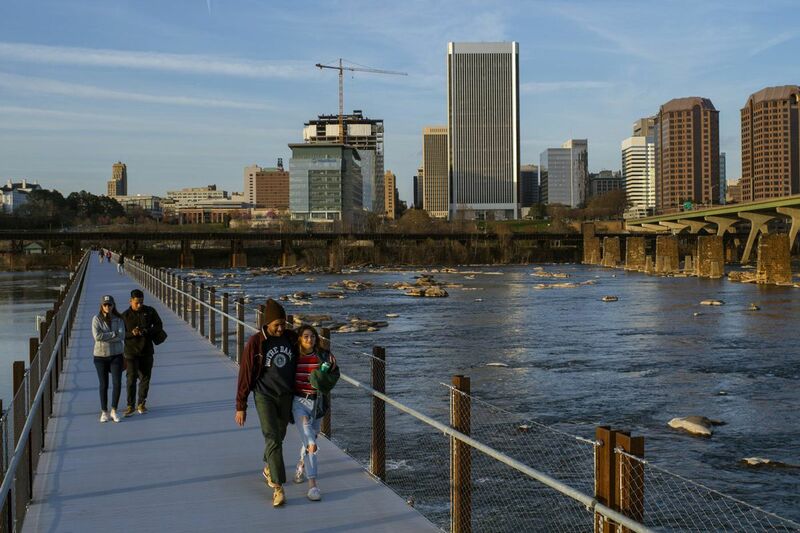 The Richmonders I know and met enjoy "RVA" for its arts, food scene and — above all — its river. The James River Park System is unequaled, and not only for the Class III and IV white-water rapids within the city limits. The riverfront and islands are the city's centerpiece, home to an annual folk festival that attracts more than 200,000 people, not to mention their notable cycling trails and secluded bathing spots. I crisscrossed Richmond many times during my visit, and oddly, didn't once see the Thomas Jefferson-designed State Capitol. But I was too charmed by the rest of the city to care. Thirty-six hours after I arrived, I drove home to Washington thinking about returning to RVA with my bike and paddleboard, grinning like I had a crush on a new neighbor who had been there all along. At lunch one day, a Richmonder commandeered my map and drew an "X" in the middle of the James River. "This is where I hang out in the summer," he said. "It's kind of magical." Short of climbing onto mid-river boulders, strolling over the new, ADA-compliant T. Tyler Potterfield Memorial Bridge is one of the best ways to be close to the James. Step onto the smartly designed boardwalk, and you're enveloped by the calming sounds of white water. Cross the one-third-mile pedestrian bridge to the Manchester neighborhood, look down onto paddlers and tubers in the rapids, gaze west to Belle Isle, a former prison for Union soldiers, and spot picnickers drinking PBR, a.k.a. the People's Beer of Richmond. Nestled among the city's largest concentration of craft breweries, in the Scott's Addition neighborhood, is Blue Bee Cider. Housed in an old city stable, Blue Bee makes artisanal ciders and offers tours, tastings and events on the dog-friendly patio. Founder Courtney Mailey gets fired up re-creating 300-year-old libations. Her single varietal Hewe's Crab is akin to the cider our Founding Fathers enjoyed. She asked, "Don't you want to know what George Washington was over the moon about?" The Institute of Contemporary Art at Virginia Commonwealth University is a striking zinc, concrete and glass building. The highly anticipated Institute for Contemporary Art at Virginia Commonwealth University is a triumph for the city and the downtown university, which already is regarded as one of the top art schools in the country. The $41 million, Steven Holl-designed structure is a striking zinc, concrete and glass building full of natural light. During a sneak peek, I saw many gathering spots for visitors to discuss the controversial art — in the opening exhibition, "Declaration," for instance, one piece is a giant, tar-covered ball of bedsheets from a penitentiary; another is a tiny diorama called, "The Execution of Unarmed Blacks." For additional contemporary works, head to the Virginia Museum of Fine Arts. Both museums are free. The Monument Avenue Historic District, which is on the National Register of Historic Places, includes statues of Confederate figures but also the humanitarian and tennis champion Arthur Ashe. The Monument Avenue Historic District, which is on the National Register of Historic Places, includes the tree-lined roadway near Richmond's museum district with statues of Confederate figures. Last summer, the mayor formed a commission that is considering whether to remove them. But the beautiful avenue also celebrates humanitarian and tennis champion Arthur Ashe, whose statue was placed in 1996. Ashe is buried at nearby Woodland Cemetery. If you have time, head east to the statue of business executive and trailblazer Maggie Walker, which was unveiled last summer on Broad Street. She's buried at Evergreen Cemetery, and her house is open for tours. "If you ever wonder why the outcome of the Civil War mattered," a park ranger at her house told me, "just look here." Residents confess to buying bread intended for friends at Sub Rosa Bakery, where the proprietors stone-mill their own wheat and rye, and eating it themselves. Stop in early for the best assortment of loaves and pastries — pains au chocolat and fig and manchego pastries daily, and cherry and pistachio croissants on the weekends — and stroll through Church Hill, where Patrick Henry proclaimed, "Give me liberty or give me death." Picnic at Libby Hill Park for a river view or at Jefferson Park for a city vista. Michael Bancroft, left, and Francesca Chesler finish up a late lunch at the counter at Kuba Kuba. The Fan district looks enough like the D.C. neighborhood Capitol Hill that part of Homeland was filmed here. Several friends recommended Kuba Kuba Restaurante y Bodega, a small, bustling spot serving Cuban fare in portions large enough to be called family style. Regulars sit at tight tables or on red bar stools, and they know not to ask about seating incomplete parties or splitting the check. Spanish music dances from overhead speakers, breakfast is served all day, and the tres leches cake is legendary. Recently named Southern Living's top restaurant in the South, L'opossum is David Shannon's four-year-old house of whimsy in Oregon Hill. The Richmond native is meticulous in everything, including his French-style comfort food and the nightly playlist. At the bar, as I savored trumpet mushrooms impersonating scallops, I was just as taken by the witty, naughty menu and the playful, eclectic art, all from Shannon's personal collection. Vintage decorative plates emblazoned with images of Bruce Lee and Liberace adorn the walls, Flintstones pillows embellish a sofa, and a terrarium with a plastic Jesus and dinosaurs is on display in the bathroom. But the food's no joke. Tip: If you can't get a reservation, eat at the bar before 6 or after 9 p.m., or try Mamma Zu up the block — with excellent fare, despite the prisonesque appearance of its building. For many Richmonders, weekend worship means brunch. The Fancy Biscuit is one of many spots where you can join the crowds for colossal portions of Southern fare, pared with a Bloody Mary or mimosa. Order off the menu or build your own buttery biscuit dish with favorites such as pimento cheese and shiitake mushroom gravy. Sister business Shyndigz Market shares the space, tempting customers with house-made cakes, ice cream, and caramel sauce. In the next block, date night means a slice o' cake and glass o' wine at Shyndigz Cafe. If ever I could resist a bookstore, it wouldn't be one called Chop Suey Books with a resident cat named Wonton. The shop has a lovely two-floor assortment of new and used titles, its own book club, and regular readings. A "Feminism is for Everyone" section sits near the front of the shop, as does a shelf of books wrapped in brown paper with online dating-type profiles — tempting if you're adventurous enough to purchase an unknown title — what the staff calls a "blind date" or "casual encounter" with a book. Hear ye, fixer-uppers! Caravati's is an 80-year-old architectural salvage shop in the warehouse district of Manchester, formerly Dogtown. Browse two floors and multiple outdoor lots to find the perfect ornate door handles and mantles, Pepto-Bismol-colored toilets, oak flooring, marble, stained glass or old barn wood. Stop at nearby Legend Brewing for a brown ale or Camden's Dogtown Market for a deli sandwich. Andras Vidim, left, and David Umetsky relax in the lobby of the HI Richmond hostel. Just a few blocks from the James River, HI Richmond hostel is one of the newest properties for nonprofit organization Hostelling International. In the stylish lobby: a pool table, halfway completed jigsaw puzzle, book swap and board games. My fellow guests included a gray-haired tourist couple and a team of AmeriCorps volunteers who were cleaning up Evergreen Cemetery. Breakfast and snacks are included, and the kitchen's stocked for cooking. The hostel, in a gorgeously renovated Otis elevator building, has warm wood floors and generous ceilings; even the top bunk is spacious. Visitors to the delightfully pink Quirk Hotel recline on raspberry sorbet-colored sofas, scoop ice from pink buckets, and borrow pink umbrellas. The dog-friendly downtown property features a barista in the lobby, a Tesla charging station outside and a spectacular bar on the roof, where guests may enjoy craft cocktails. Shop in the adjoining Quirk Gallery for pieces from local artists, including DIY felt fortune cookies and dachshund-shaped emery boards. Starting at Byrd Park, drive across the James at Nickel Bridge (now a seven-nickel toll) to the neighborhoods around 105-acre Forest Hill Park, where locals picnic, stroll, and bike. First you'll pass Outpost Richmond, a bike store with specialty groceries, and Little Nickel, a new "vacation food" restaurant. Less than a mile to the east, you'll hit Crossroads Coffee & Ice Cream, a popular cafe with live music most days, and the restaurant Laura Lee's. The South of the James Farmers Market convenes every Saturday on the park's west end. Say you're a vintage-lover, letter-writer, gamer, smoker, vaper, skater, runner, cyclist or old-school reader. Or you want to eat, drink, get inked or get caffeinated. Or you're still hung up on cupcakes. Carytown, an eight-block strip of shops and restaurants along Cary Street, has something for you. At Rocket Fizz Soda Pop & Candy Shop, find Stalinade (the "Real Red Soda") and a Rosie the Riveter action figure. The 90-year-old Byrd Theatre shows second-run movies and series for film buffs, such as Tarantino Tuesdays and Mob Mondays. Where to stay: HI Richmond hostel, hiusa.org/hostels/virginia/richmond; Quirk Hotel, destinationhotels.com/quirk-hotel. Where to eat: Blue Bee Cider, bluebeecider.com; Kuba Kuba Restaurante y Bodega, kubakuba.info; L'opossum, lopossum.com; Sub Rosa Bakery; subrosabakery.com; The Fancy Biscuit, fancybiscuitrva.com. Where to shop: Caravati's, caravatis.com; Chop Suey Books, chopsueybooks.com.